I’ll be away from the blog for the next couple of weeks, off to North Dakota with my siblings to handle some of my Dad’s affairs. I didn’t write about it when it happened, but he died late last year and now it’s time to deal with what’s left. Paul and I are driving, which I figure is a fitting tribute to my dad, who always crammed us in the car and gunned it so he could get us from TX to ND in 2 days. 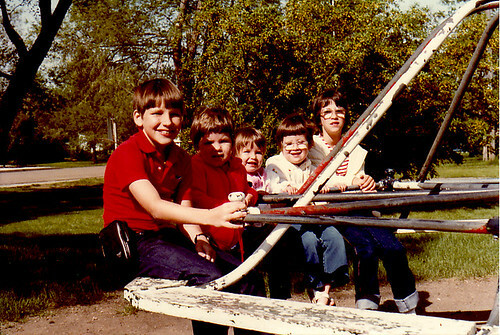 Here we are in 1982 on the local playground. Of course the only thing keeping me sane in thinking about all of that car time is knowing that I can knit and crochet in the car. 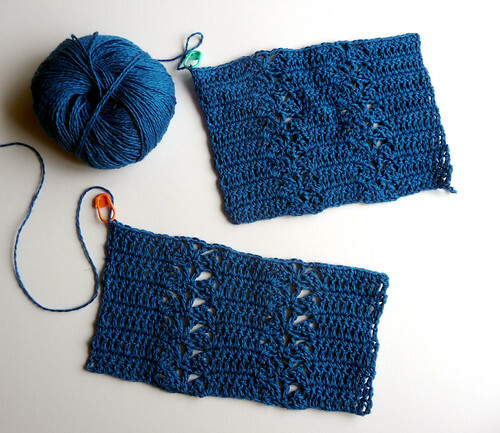 I have my Zipline Shell* packed, along with another scribble shawl (which is turning out so gorgeously, but I may run out of yarn, sigh), a swatching kit for an upcoming project…and the sleeves of a project I’ll publish in another month or so. Sounds like a lot, but it’s mostly “for fun” needlework, really. I was expecting to get some deadline yarn by now, but it looks like there will just be a pile when I return, instead. Something to look forward to, at least. *Yes, I swatch even when I am using my own patterns. Which is a good thing, because this Hempathy yarn works up completely differently than the Tahki Cotton Classic I used for the Interweave Sample. It’s a little tough on my hands because it’s so sturdy, but I think I will like the finished result. I think I made 3 swatches to figure out what I wanted, but I’m also adjusting the gauge to get an in-between size. Anyway- back to the point of this post! My blog will likely be quiet for the next few weeks. But then I will return, like I always do. Happy summer! Just made the ball and booties from the new book and loved how they came out. Then as I was scrolling down the sight I saw the market bag that I've started out of cotton. Great designing LInda! So sorry about your loss of your dad. We lost Stan's mom 3 months ago, and this coming week is the week we finish up her stuff. The financials are mostly done, now just the things one accumulates over 94 years of living. I'm sure there will be memories, laughter, and tears. For you too, I'm sure. Hang in there. HUG. I am very sorry to hear of your loss. We'll miss you while you're gone, but I hope everything goes as well as can be expected. I'm glad you're looking forward to the crochet! Those swatches are beautiful! XO! Very sorry to hear about your dad. It's very nice to have such wonderful memories to share with your siblings.